Stainless steel 43mm case, Ulysse Nardin in-house automatic movement with date and 42 hour power reserve. The royal blue color dial is etched with images of sharks with a larger red color shark by the register at the 3 position. 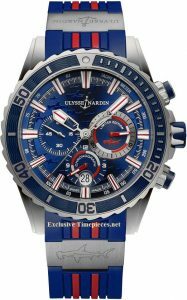 Available on sporty blue and red rubber strap with titanium folding buckle. Join us INSTAGRAM & FACEBOOK. We’d love to have you!